Leading Manufacturer of suspension magnet, hump magnetic separator and ss hump magnetic separator from Vadodara. We are one of the leading manufacturers & suppliers of Suspension Magnet. We are one of the leading manufacturers & suppliers of Hump Magnetic Separator. 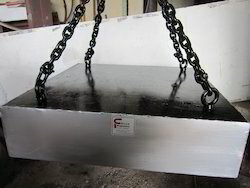 It consist of ‘z’ type of shape chute made out of s.S. Construction placed magnet plate such way that maximum material will pass through the magnetic plate at the same time due to z tube of chute construct material will again fall on another magnetic plate due to tumbling effect maximum material come in contact with magnetic plate. Being an easy construction. It is more practical to use grain or sluggish material. Very good for flowability material, sluggish material. Easy to clean as magnet plates are fixed with wing nut arrangement. Suitable to handle huge quantity. 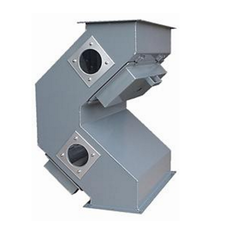 We are one of the leading manufacturers & suppliers of SS Hump Magnetic Separator.